Good Morning, we have a new Merry Monday Christmas Card Challenge. Colleen is our hostess this week and her challenge is to Add a penguin to your Christmas card. 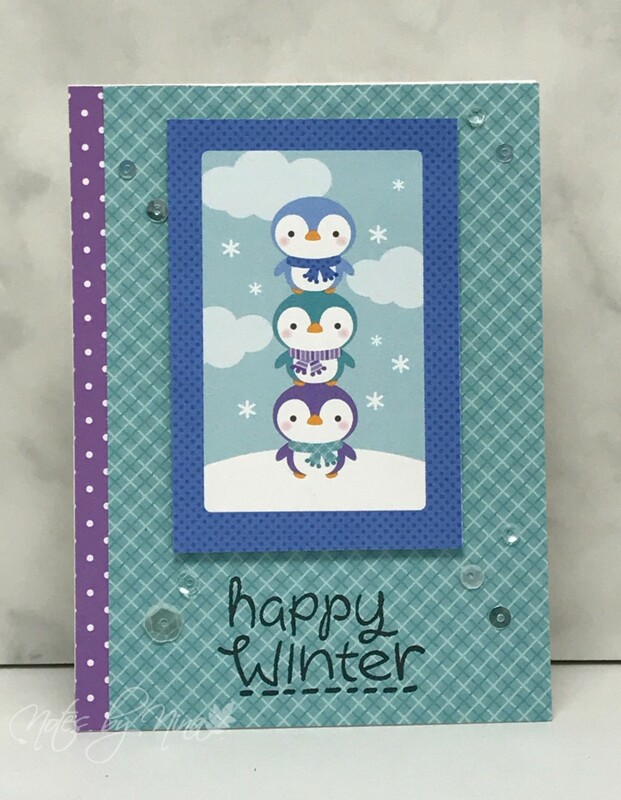 I created a smaller card for this challenge 3" by 4", I has this adorable little panel of critters but the larger card size made them look to small. I was working with scraps again, I guess I should clean up my desk a bit ;). 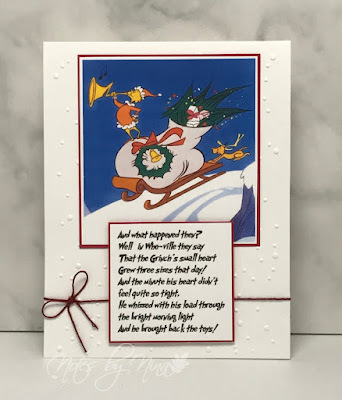 I lined of the designer paper right to the edge of the card base, I layered the center panel and popped it up with foam tape. 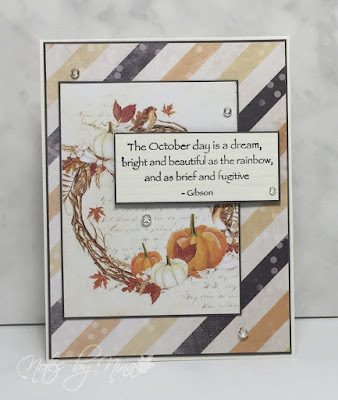 I stamped the sentiment and finished with a blend of sequins and gems. Supplies: White card stock, Designer Paper - Doodlebug, Lawn Fawn - Frosties, sequins, gems. Stop by the Merry Monday Christmas Card Challenge blog to see all the fabulous cards created by the Design Team. 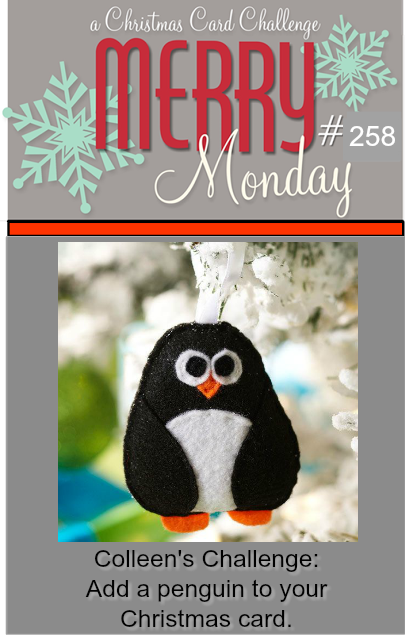 Good Morning, welcome to a new Merry Monday Christmas Card Challenge. Sue is our hostess this week and her challenge is to Add a decorated tag to your card using texture, bling and die cuts. Well holy cow, that is quite the request :) I was up for the challenge - how about you? 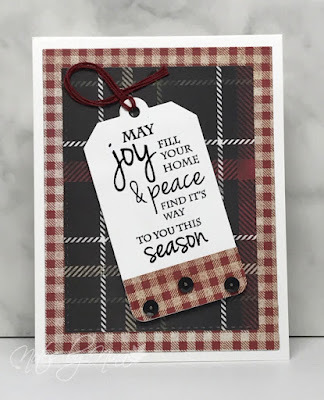 I was feeling just a little bit country when I created this card, I think it was the music :). I still had some scraps from a piece of Sleigh Bells Ring by My Mind's eye on my craft table and it worked out just fine. I die-cut simple layers with my stitched rectangles. 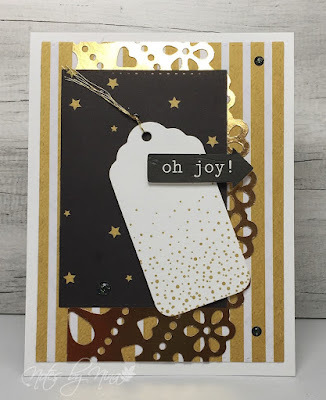 I used a die cut for the tag as well and I heat embossed the sentiment to add a little texture to my card. I finished the tag off with a small piece of DP along the bottom. Twine and sequins finished the project, there is some added dimension with foam tape under the tag as well. 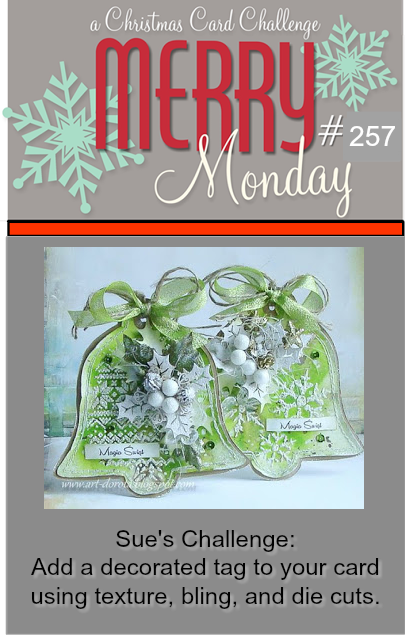 Supplies: White cardstock, Designer Paper-My Mind's Eye, Simon Says and Lawn Fawn die cuts, KaiserCraft - Yuletide, twine, sequins. Be sure to stop by the Merry Monday Challenge blog, joining the fun and play along. The Design Team has some get inspiration posted. A big wonderful shout out to my big sister HAPPY BIRTHDAY BARB. I found these bright and cheery papers at the top of my stash and though they would do nicely for a birthday celebration. 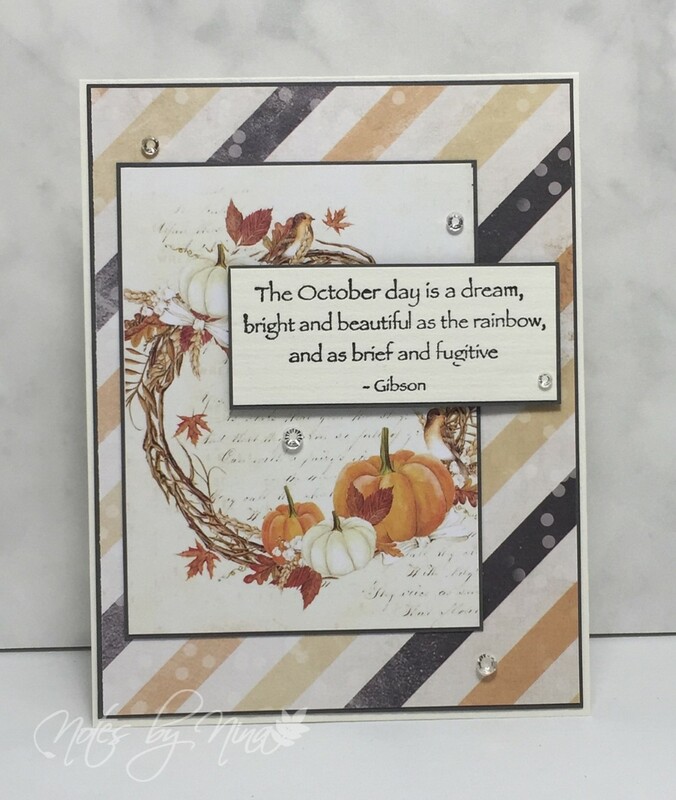 I used layers for my card, and of course my stitched die cuts. I added in these pretty flowers with some sequins scattered about. I finished with a popped up sentiment. My sister is coming to visit me in only a couple short weeks and I am so excited. 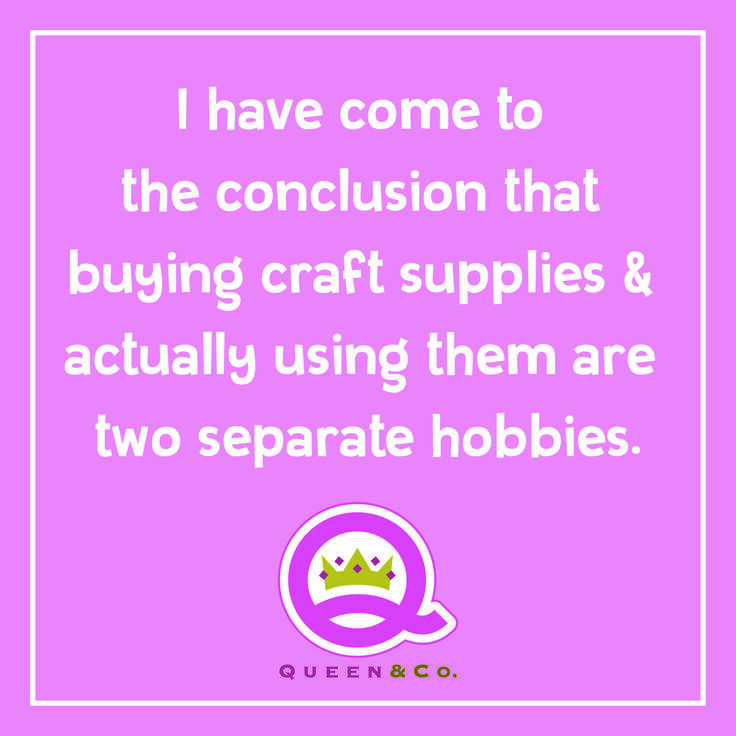 I am hoping we get lots of quality time in the craft room. On another note, I am an Apple fan.. just a wee one. I am all excited, today is release day for the new iWatch. Perhaps a little early birthday gift for me ;). Cheers all, have a fabulous day. 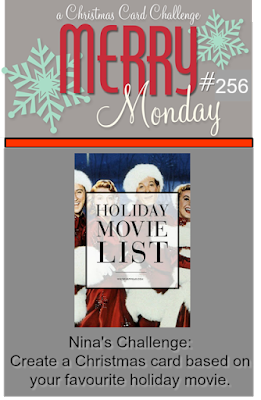 Welcome back to the Merry Monday Christmas Card Challenge, we took at little break for summer but are so excited to get back at it. Are you ready to get all those Christmas card ready, the holiday season is right around the corner. 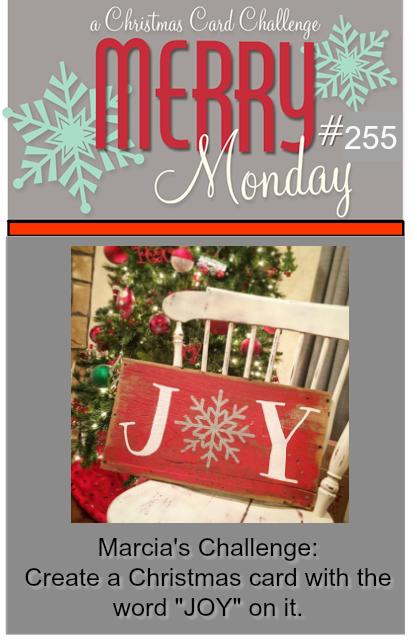 Marcia is getting us back on track with her challenge this week, Create a Christmas card with the word Joy on it. I picked this fun paper up with past spring in a sale bin, a whole little set of great papers, a very large gold doily and some die cut sentiment and tags. I used lots of layers and foam tape and finished with some fine gold twine and black dots with gold sparkles. 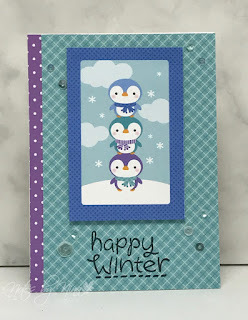 Supplies: White card stock, Designer Paper and die cuts - Kaisercraft, dots, twine.